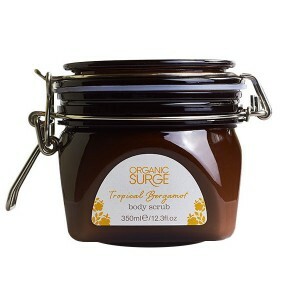 Moisturising hand & body cream with the tropical scent of Bergamot and Sweet Orange organic essential oils. Conditions and hydrates all skin types. Tropical Bergamot Hand & Body Cream has an intensive moisturising action and is quickly-absorbed to provide comfort and hydration. It works to prevent moisture loss to leave hands & body softened and rejuvenated. This product was previously known as bergamot hand cream. For all skin types. Improved formula and new product format has increased this from a 75ml tube of hand cream to a 250ml pump dispenser of lotion suitable for hand and body. Sweet Almond Oil, Natural Glycerine, Sweet Orange, Bergamot. Aqua (Water), Aloe Barbadensis Extract*, Caprylic/Capric Triglyceride, Glycerin, Isopropyl Myristate, Glyceryl Stearate, Polyglyceryl-3 Dicitrate/Stearate, Cetearyl Alcohol, Butyrospermum Parkii*, Theobroma Cacao (Cocoa) Butter*, Benzyl Alcohol, Dehydroacetic Acid, Citrus Aurantium Bergamia (Bergamot) Fruit Oil, Citrus Aurantium Dulcis (Sweet Orange) Peel Oil, Sodium Stearoyl Glutamate, Sodium Phytate, Xanthan Gum, Citric Acid,Limonene, Linalool, Citral. *ingredient from organic farming. Naturally occurring within essential oils. Natural and Organic Cosmetic certified by ECOCERT Greenlife. 99% of the total ingredients are from natural origin. 26.2% of the ingredients are from Organic Farming. Free from animal-derived ingredients. Suitable for vegetarians and vegans. Product colour or texture may vary slightly due to natural ingredients. Store in a cool dry place, out of direct sunlight. Massage into hands, nails & body as needed, breathing in the organic essential oil fragrance blend.